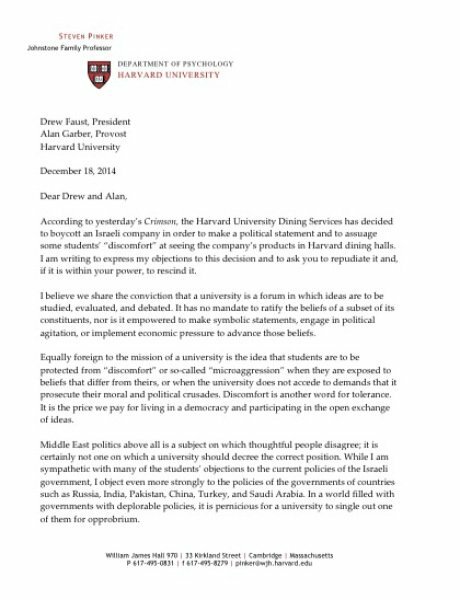 One of Harvard University’s most renowned professors, psychology theorist and philosopher Steven Pinker, has written a harsh letter to the university’s president and provost protesting a decision by Harvard University Dining Services (HUDS) to ban the use of SodaStream water systems. SodaStream, an Israeli company, became the target last year of intense boycott efforts despite the fact that it employed hundreds of Palestinian workers in its Maaleh Adumim factory under conditions identical to those enjoyed by their Israeli counterparts. In response to the move, the university’s president, Drew Faust, reportedly opened an investigation. Equally foreign to the mission of a university is the idea that students are to be protected from “discomfort” or so-called “microaggression” when they are exposed to beliefs that differ from theirs, or when the university does not accede to demands that it prosecute their moral and political crusades. Discomfort is another word for tolerance. It is the price we pay for living in a democracy and participating in the open exchange of ideas. Middle East politics above all is a subject on which thoughtful people disagree; it is certainly not one on which a university should decree the correct position. While I am sympathetic with many of the students’ objections to the current policies of the Israeli government, I object even more strongly to the policies of the governments of countries such as Russia, India, Pakistan, China, Turkey, and Saudi Arabia. In a world filled with governments with deplorable policies, it is pernicious for a university to single out one of them for opprobrium. SodaStream is a company that is not only committed to the environment but to building a bridge to peace between Israel and Palestine, supporting neighbors working alongside each other, receiving equal pay, equal benefits and equal rights. That is what is happening in their Ma’ale Adumim factory every working day. After the Johansson controversy, she was joined by television star Ellen DeGeneres in publicly standing behind SodaStream. The boycotters even targeted billionaire George Soros, a harsh critic of Israel and funder of anti-Israel activities, because his investments included SodaStream. Recent months have dealt a difficult series of blows to the campus boycott movement. In September, the official Palestinian Authority newspaper Al Hayyat Al-Jedida published an article praising the conditions enjoyed by Palestinian workers in Israeli factories such as SodaStream’s. More recently, the Open Hillel movement, which seeks to convince the Hillel organization to allow cooperation with boycott-supporting student groups, suffered the public repudiation of the organization by one of its founders, Holly Bicerano, which followed a major investigative report about the group in The Tower Magazine by Aiden Pink. And just this week, it was revealed that Wesleyan university’s food service providers had chosen to restock Sabra brand hummus, after what had once been considered by supporters to be a significant campus boycott victory.